An overnight thunderstorm with heavy rain presented the opportunity to wipe down the boat this morning to remove some accumulated dirt and pollen. We departed mid morning through a lengthy, narrow canal, through Cameron Lake (another flooded piece of land with many visible stumps remaining and the ever present danger of hitting one) and then into Balsam Lake. 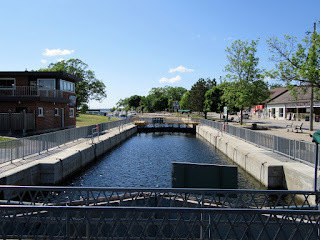 Now going from Port Severn in southern Georgian Bay to Trenton on the Bay of Quinte (north to south), the first section you are going up a series of locks, a marine railway and a lift lock. 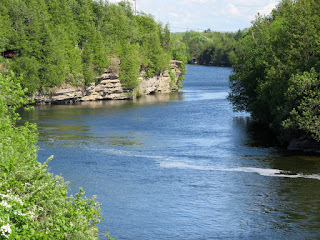 After that, you start heading down towards the Bay of Quinte and Lake Ontario. Balsam Lake is the high point of the Trent Severn Waterway. For those with a nautical interest, at this high point of the system, the orientation of the buoys reverses. For the first part of the journey, red buoys were always taken on the starboard (right) side of the boat and green buoys are taken on the port (left) side. Starting in Balsam Lake and heading south, the buoys switch so now red is taken to port and green to starboard. To keep the boat safe, this is obviously a important change to pick up on. Balsam Lake is a very popular cottage and camping location with great fishing for bass, pickerel (walleye) and muskie. 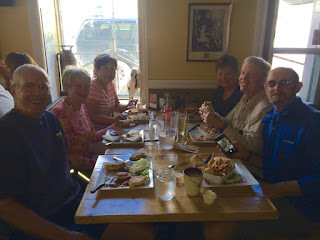 We had a lovely passage through Balsam and on through the tiny village of Rosedale and down its lock and finally, across a small body of water to Fenelon Falls. Today, Fenelon Falls is a very popular spot for cottagers, boaters and tourists. But there is much more to its history. It was founded in 1833 by James Wallis, an Anglo-Irishman who had immigrated to Canada in 1832. 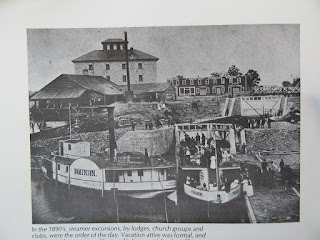 He purchased land in Fenelon Falls in partnership with Robert Jameson (of the famous Irish whiskey distilling family) and they established a saw mill and a grist mill. These enterprises attracted settlers as lumbering became the lifeblood of Ontario in the mid 1800’s. 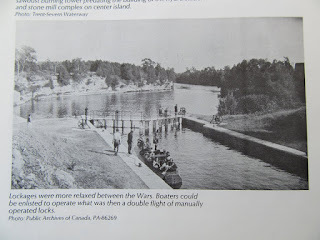 Over the years, steamboat navigation also grew on the Kawartha lakes making this a growing resort destination. 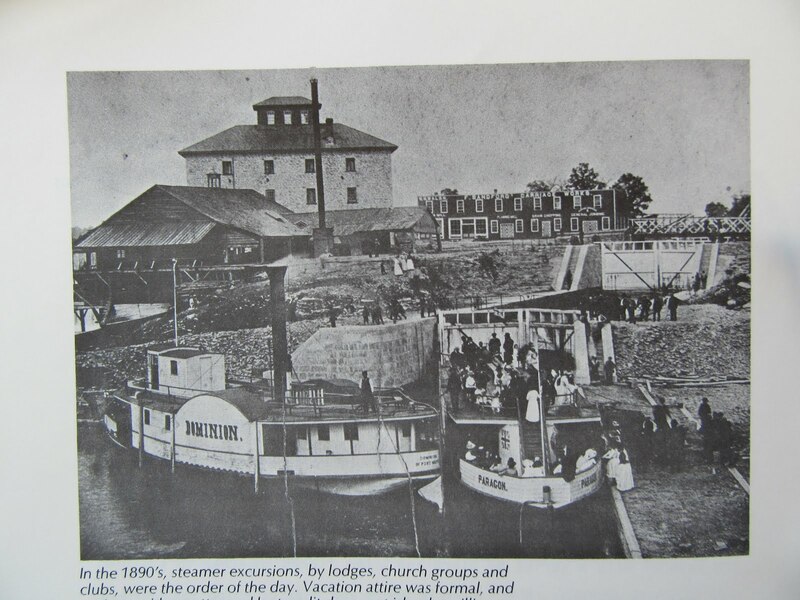 However arrival of the steamboats caused some conflicts between the steamboat operators and the lumbermen over navigation rights. Eventually by 1873 a compromise was reached when the government divided the channel with piers and booms linked together to separate the logs form the ships. 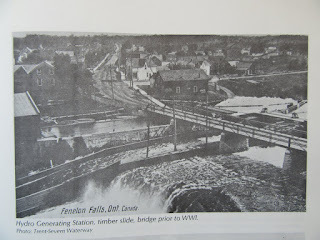 The Victoria Railway Company established a rail line to Fenelon Falls and by 1887 the Federal Government had built a two flight lock and swing bridge to overcome the 24’ difference in elevation between Sturgeon and Cameron Lakes. Like many areas of the province, excess logging ended the lumber business. Also, with the decline of steamboat excursion traffic after World War I, Fenelon Falls declined in importance as a resort destination. However mass cottages and recreational boating made up for much of this commercial loss. In 1963 the two flight lock and swing bridge were replaced by a modern single lock and fixed bridge. 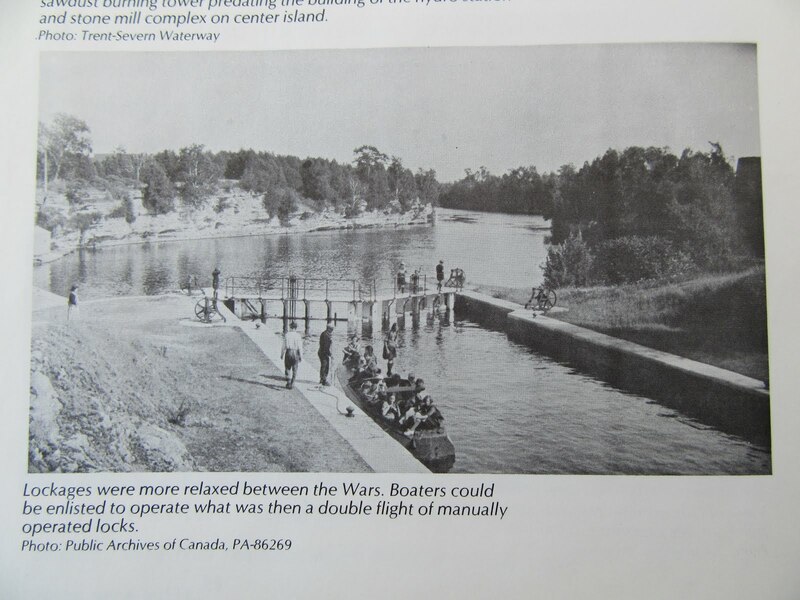 To save money and preserve some evidence of the former flight locks, when you exit the lower side of the new lock you pass through the former stone walls of the lower of the two flight locks. The original limestone blocks weigh up to two tons each and were mined from the local area. 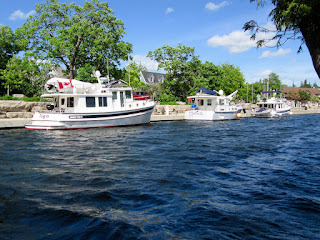 Steamships at the Fenelon Falls Locks. Formal attire only!